Mini Bio: Sasha Banks thrives on silencing her critics. Once told she wouldn’t be tough or strong enough to make it in NXT, Banks continues to prove the doubters wrong. She draws upon her naturally competitive nature and will to compete, proving herself a token of inspiration to anyone who was ever denied an opportunity. Note: Please be advised that Sasha may or may not appear at all advertised events this is subject to change without notice sometimes. For More Information and Tickets, click here. Do you have pictures of Sasha from the WWE Live Event you went to or the Meet and Greet you attended and want to share them with the world? Have you met Sasha and wanted to tell everyone about your experience? You have? Great! You’ve reached the right place. Here at SashaBanksDaily.com we love it when fans send in their candids or their stories when they’ve met Sasha. 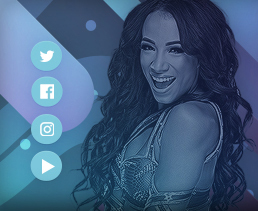 If you want to send in candids, or your story about your exprience meeting Sasha, then you can send us them by emailing us at SashaBanksDaily@gmail.com! All credit WILL be given if you send us any contribution. Thank you! Welcome to WWE Monday Night Raw. There is a recap video of the Royal Rumble PPV. Stephanie McMahon makes her way to the ring. Stephanie welcomes everyone to Raw. She says it has been a historic week for WWE. Last week they celebrated 25 year of Raw. Tonight, they kick off 25 more. Last night we saw the first ever Women’s Royal Rumble Match. Sasha lasted almost an hour. Nia Jax proved why she is an unmovable force. We saw Hall of Famers like Lita, Jacqueline, Beth Phoenix, and Trish Stratus. When all was said and done, the game changed when we had the surprise entrance of WWE’s newest superstar Ronda Rousey. Tonight is about the winner of the historic Rumble match. Stephanie brings out Asuka. Asuka points to the Wrestlemania sign. Stephanie says that this would be the time when she would ask Asuka about the title she wants to wrestle for. Alexa Bliss may not be the champion at Wrestlemania because she will defend the title in the first Women’s Elimination Chamber Match. Asuka speaks in Japanese and then points to the Wrestlemania sign. She says she will become the champion at Wrestlemania because NO ONE IS READY FOR ASUKA. Sasha Banks comes out to the ring. Sasha apologizes for the interruption but she has something to get off her chest. Last night was a dream come true and women got to main event the Royal Rumble. Last night, she got to share the ring with 29 incredible women and one of them was you. Sasha says she wants to congratulate Asuka on her victory. 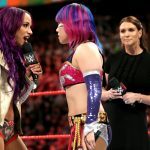 Sasha mimics Asuka and she proved that she can go the distance. Sasha says she is ready for Asuka . . . tonight. Stephanie makes the match official between Sasha and Asuka. Sasha Banks is with Renee Young and she is asked about facing Asuka tonight. Sasha says she is moments away from beating Asuka. She has been waiting for this for a long time. Asuka has been undefeated for more than 2 years and now it is her time to make history. They lock up and Sasha pushes Asuka in the corner on the break. Sasha with a rollup for a near fall. Asuka with a side head lock. Sasha with a forearm but Asuka with a shoulder tackle. Asuka with an arm drag but Sasha with an arm bar. Sasha with forearms in the corner and she chokes Asuka. Asuka puts Sasha on the apron and Sasha with a kick but Asuka avoids a shoulder and kicks Sasha and follows with a running hip attack to knock her off the apron. Sasha gets back into the ring before the ten count and Asuka with hip strikes to the head. Asuka chokes Sasha in the corner and kicks Sasha. Asuka works on the arm and tries to hyperextend it. Asuka with an arm bar. Sasha with a forearm but Asuka with an Irish whip. She runs into an elbow and Sasha blocks a kick and connects with a knee followed by a basement Meteora for a near fall. Asuka with kicks to the chest but Sasha puts her on the middle ropes and Sasha with a double knee drop. Sasha with a knee to the back and then she stretches Asuka. Sasha sends Asuka to the mat. Sasha with a suplex and she gets a near fall. Sasha with a slap and she mocks Asuka. Sasha pie faces Asuka and Asuka with strikes to Sasha. 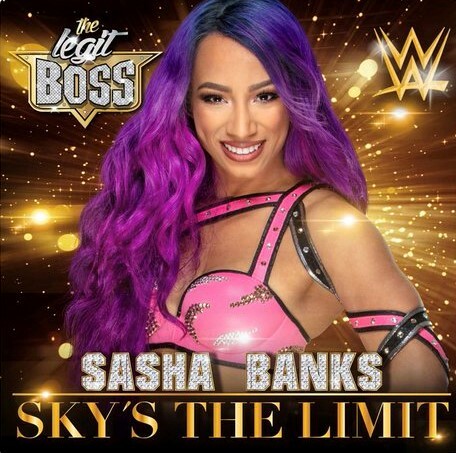 Sasha with a take down into a version of the Banks Statement. Asuka with a rollup for a near fall. Asuka with a back slide and Sasha escapes and applies the Banks Statement. Sasha sends Asuka to the floor and she goes for a suicide dive but Asuka kicks Sasha in the head and Sasha is down on the floor. Sasha and Asuka with forearms in teh ring. Asuka with a pop up knee followed by spinning back fists and a spinning back heel kick and a Shining Wizard. Asuka with a running hip strike in the corner. Asuka goes up top and hits a missile drop kick for a near fall. Sasha with a rollup for a near fall. Asuka with a cross arm breaker but Sasha with a rollup for a near fall. Sasha goes to the apron and Asuka goes for a running hip strike but Sasha moves and Asuka goes through the ropes and to the floor. Sasha with Meteora off the apron. Sasha comes off the turnbuckles with a flying knee and she gets a near fall. Asuka goes for the Asuka Lock but Asuka is sent into the turnbuckles. Sasha with a lungblower and the Banks Statement. Sasha uses the ropes to roll into the center of the ring but Asuka counters into the Asuka Lock and Sasha taps out. Nia attacks Asuka from behind and all eight women pair off in the ring. The referee tries to get some control of the situation and the match starts with Asuka and Sonya. Asuka with strikes to Sonya and a hip attack. Asuka with kicks to the midsection and Sonya goes to the floor. We are back and Asuka with a hip attack to knocks Alicia and Sonya off the apron. Asuka with a knee and sliding kick to Mandy. Sasha tags in and they hit a double suplex. Nia tags in and Sasha wit kicks and a running knee to the head for a near fall. Nia with a uranage to Sasha and then she gets a near fall. Mandy tags in and kicks Sasha in the corner. Sonya tags in and she punches Sasha in the midsection. Alicia tags in and she gives Sasha a Northern Lights suplex for a near fall. Alicia with a reverse chin lock. Alicia sends Sasha to the mat and gets a near fall. Alicia returns to the reverse chin lock. Sasha gets out of the hold but Alicia with a running boot for a near fall. Sasha with an elbow and Alicia pulls Sasha down by the hair. We are back and Alicia sends Sasha into the corner but Sasha with a kick and she sends Alicia to the mat. Sonya pulls Sasha off the turnbuckles and then everyone not in the match battles on the floor. Alicia misses a Yakuza Kick and then Sasha with a lungblower and Banks Statement that forces Alicia to tap out. After the match, Mickie gets on the turnbuckles and Asuka pushes her over the top rope to the floor. Asuka attacks Sasha and Bayley and sends Bayley over the top rope. Sasha goes for a lungblower but Asuka holds on to the ropes. Asuka with a back heel kick and she sends Sasha over the top rope to the floor. The women start things off and the lock up to a stalemate. Natalya retreats into the ropes and goes to the apron. Nakamura is tagged in so Balor enters the match. They lock up and Balor with a waist lock. Nakamura with a side head lock take down but Balor with a head scissors. Nakamura escapes and Nakamura with a side head lock but Balor with a head scissors and Nakamura escapes. Balor with a wrist lock but Nakamura with a reversal. Balor with a side head lock and he holds on when Nakamura tries to send him off the ropes. Nakamura backs Balor into the ropes and he leans against the chest but Balor pushes Nakamura. Nakamura tells Balor to come on and Nakamura with a knee to the midsection. Balor sends Nakamura to the mat and then both of them miss kicks. Natalya tags in and that brings in Sasha too. Natalya mocks Sasha and then they lockup. Sasha shows Natalya how it is done and they pie face each other. Sasha with a Thesz Press and she blocks a kick and slaps natalya in the face. Sasha with an Irish whip but she misses a charge into the corner. Natalya with a slingshot atomic drop and then she runs over Sasha’s back and hits a drop kick for a near fall. Natalya runs Sasha into the turnbuckles and she kicks Sasha in the corner. Sasha with a kick to the head and then she sends Natalya into the turnbuckles. Sasha puts Natalya across the middle rope and she hits a double knee drop for a near fall. Natalya goes to the floor. Natalya and Nakamura talk strategy and Sasha goes for a cross body but Nakamura catches her and puts Sasha on the apron. Sasha leaps over Nakamura and hits a cross body onto Natalya on the floor. Natalya with a discus clothesline and she gets a near fall. Natalya with a sleeper and we see Sami Zayn and Becky Lynch in the same room with a monitor showing the match. Sasha with an arm drag but Natalya prevents Sasha from making the tag and Natalya with a Michinoku Driver for a near fall. Natalya with an abdominal stretch and she pulls up the leg to add more pressure. Sasha with an arm drag to escape and Natalya stops Sasha from making the tag. Balor tags in and he hits a series of running forearms. Balor with a running chop into the corner. Nakamura kicks Balor but Balor with an enzuigiri and a elbow drop from a reverse DDT for a near fall. Nakamura with a series of strikes but Balor with a chop. Nakamura with a knee and enzuigiri. Nakamura with a running knee into the corner and then he puts Balor on the turnbuckles and hits a running knee to the chest for a near fall. Nakamura goes for a reverse exploder but Balor with elbows. Nakamura with a sit out gourdbuster and he sets for Kinshasa but Balor with slingblade. Balor with a running drop kick that sends Nakamura into the turnbuckles and Balor goes up top but Natalya hits the ropes to crotch Balor. Nakamura with a sliding boot to the head but Sasha breaks up the cover. Sasha and Natalya go to the floor. Nakamura sets for Kinshasa but Balor sends Nakamura into the ring post shoulder first. Sasha tags and she hits Meteora off the apron. Sasha with a kick to Natalya and then Sasha and Balor too sweet and they hit drop kicks. Sasha with a lungblower into Banks Statement and Natalya taps out. Renee and Byron talk about next week’s match featuring Carmella and Big E versus Asuka and Miz. We get comments the New Day and Carmella about giving Asuka her first loss. Asuka starts to scream in Japanese and it freaks out Miz a bit. Sonya with a waist lock and take down. Sasha goes for the Banks Statement but Sonya escapes. Mandy distracts Sasha and Sonya runs Sasha into the turnbuckles. Sonya with an Irish whip and Sasha tries to float over but Sonya with a knee to the midsection. Sonya with more knees for a near fall. Sonya with a body scissors. Sasha backs Sonya into the turnbuckles to get out of the hold. Sasha with forearms and a head scissors take down. Sasha with a drop kick followed by running double knee strikes into the corner. Sasha goes up top but Sonya with a kick to the midsection for the three count. We have a video package of the WWE Superstars at the National Civil Rights Museum last week in Memphis.